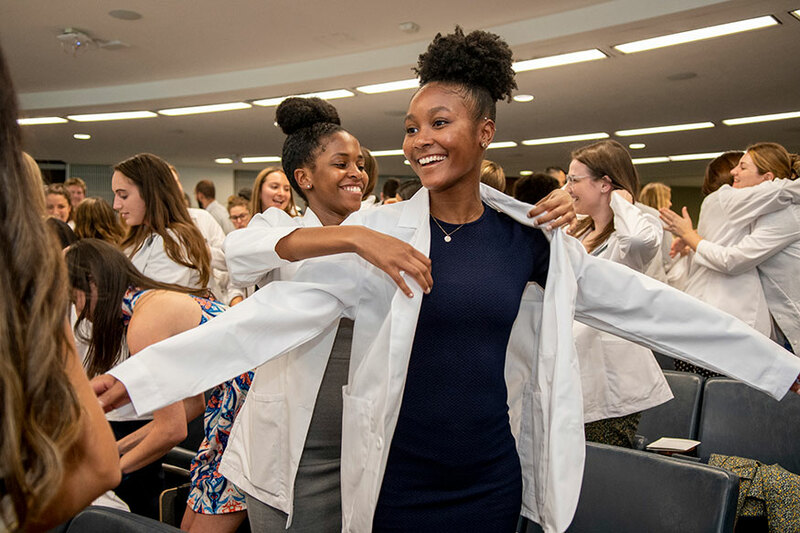 Assisted by second-year physical therapy (PT) students, members of the George Washington University School of Medicine and Health Sciences (SMHS) Physical Therapy Class of 2021 slipped their arms into the sleeves of their new white coats, donated by the DPT Class of 2018. The 46 members of the class have been taking classes and exploring the Foggy Bottom Campus since late summer, but the PT Convocation and White Coat ceremony officially marked the start of their PT education. Costello added that she was impressed with the number of volunteer hours the students had served prior to entering the program: they boast more than 40,000 hours of extracurricular activity with an average volunteer time in PT clinics or hospitals of about 250 hours per person. Following the award presentations, Michael Johnson, PhD, PT, president of BAYADA Home Health Services, gave the excellence lecture, which focused on the important of the personal connection with patients in our health care system. He started with a story about Patty O., a 77-year-old woman, former nurse, and mother of five. Over the last couple of years, he said, her family noticed she had some difficulty remembering things, but she was still living on her own. That was, until the family saw signs she was suffering from dementia. After she started to deteriorate, her family had to place her in a senior living facility, he said. How does he know so much about Patty? Because she’s his mother. “My point with this is, the work you do is personal. It is about people, and while you’re not taking care of my mother necessarily, you’re taking care of someone else’s mother,” he said. There are a whole host of services that, if knitted together, could keep people safe, at home, and in their neighborhood, he added. In addition to welcoming the newest members of the GW family, the ceremony also celebrated current students, residents, and alumni. Holly Jonely, ScD, PT, associate director of the Doctor of Physical Therapy Program, presented the Excellence in Residency Mentorship Award to neurological resident Katherine Brundage, DPT, PT, and orthopaedic resident Andrew Kunin, DPT, PT. Three individuals who recently graduated from the Orthopaedic Residency Program, one graduate of the Neurological Residency Program, and one graduate of the Pediatric Residency Program also received recognition. In addition, 10 second- and third-year students also were recognized for their commitment to excellence and received awards for their contributions to the community, for their professional service, and for their academic achievement. At the end of the event, as students beamed while admiring their new coats, they also tucked their hands into the pockets to find notes from the alumni who donated their coats, offering words of advice and support to students who are just starting their professional journey.